HSSC has extended last date for Haryana Police recruitment 2018 through recruitment advt 3, 2018. 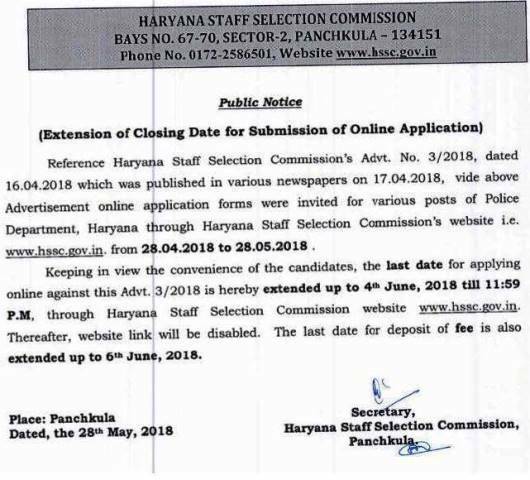 Haryana Staff Selection Commission(HSSC) has extend last date of submission of fee for Haryana Police recruitment 2018. From last days, candidate were not able to submit their fee for the advt 3, 2018. This was intermediate server error. Now HSSC extend last date till June 6, 2018. Candidate who already applied their form can pay their fee till 2nd July. Now applicant can fill their online application till 4th June 2018 and make online payment till 2nd July 2018.